RSVP below! It’s FREE and with no obligations! Course fees are due upon confirmation of the class. 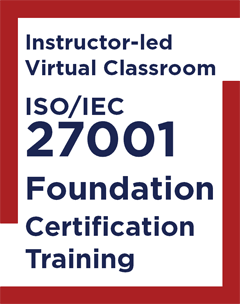 The syllabus of ISO/IEC 27001 Foundation course is designed to provide knowledge and understanding of what an information security management system is. Want to learn all about the minimum requirements that organizations should aspire to, within the context of ISO/IEC 27001? This is your course! And, are you seeking to boost your credentials with an internationally recognized certificate? A 40-minute certification exam will test your capability to “recognize” and “understand” the ISO/IEC 27001 concepts that are explained during an interactive class. Successful candidates will receive APMG’s ISO/IEC 27001 Foundation certificate. This high-in-demand certification confirms your knowledge in information security management systems, or ISMS, as per ISO/IEC 27001. Those who have RSVP-ed will be notified when this course has been confirmed. Upon confirmation you will be provided with a link to make an online payment. The fees per student are: $1,195. Fees include exam fees and shipment costs of course materials within the Continental US. A surcharge will apply when shipping internationally.